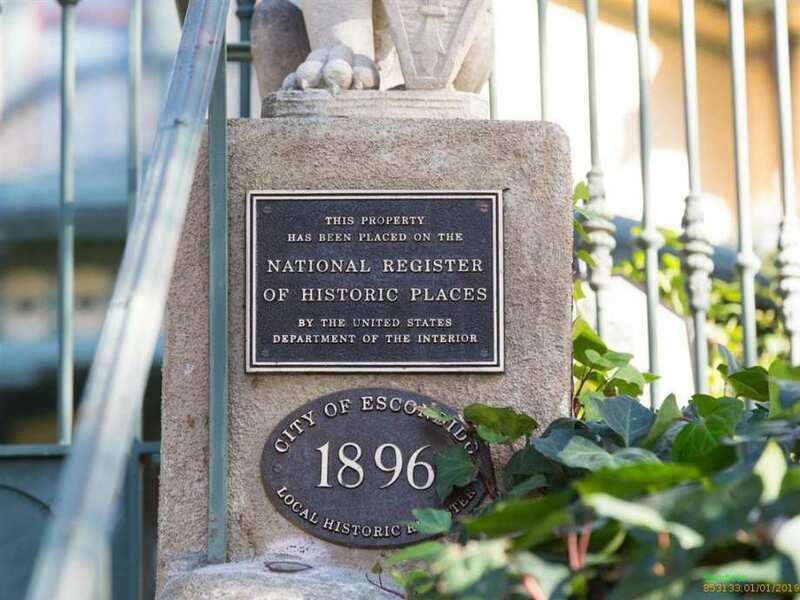 One of San Diego's cherished, architectural treasures on the National Registry of Historical Places & part of the Mills Act. The Victorian estate sits atop a private, .5+ acre knoll, surrounded by exquisite gardens, mature trees, Swiss Victorian gazebo, two porches & rear patio. 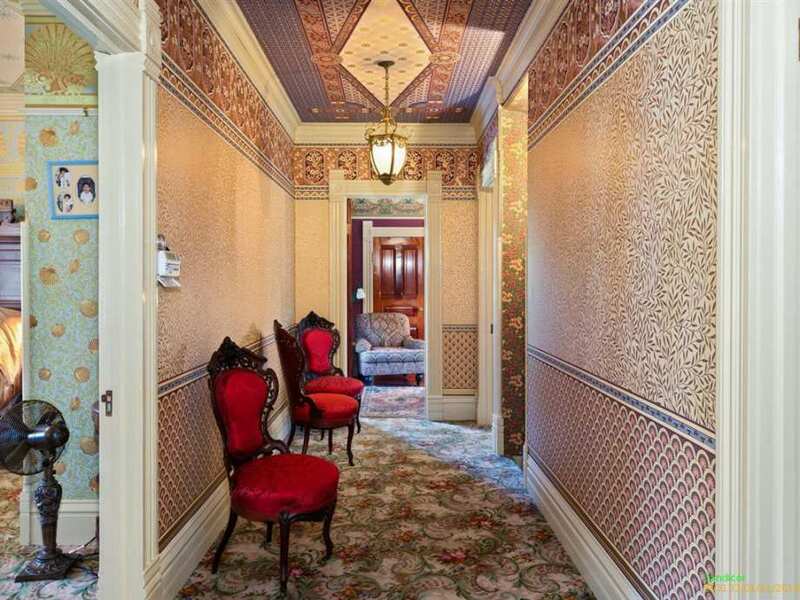 The interior is a romantic, articulately planned turn-of-the-century masterpiece with one of the most intricate collections of hand-printed Bradbury & Bradbury wallpaper in the country. Ideal location. 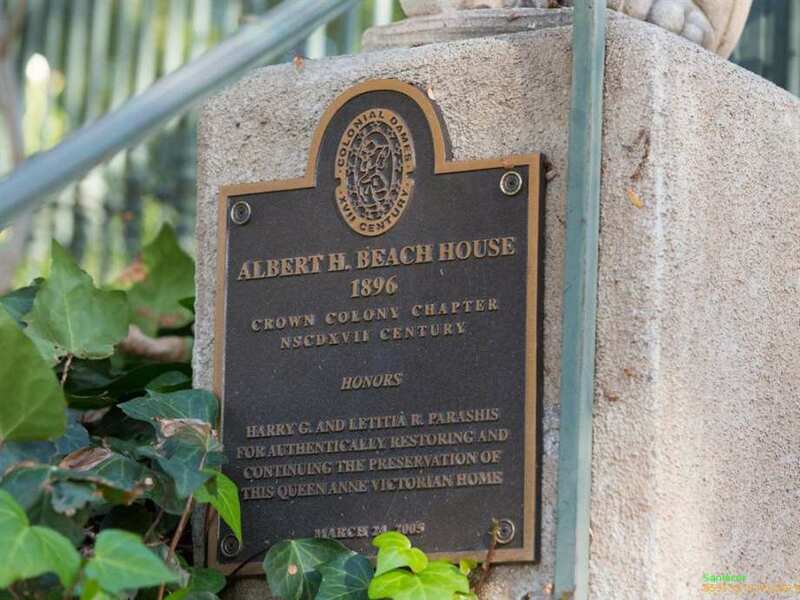 The A. H. Beach House, also known as the Bergman House, was built in 1896. 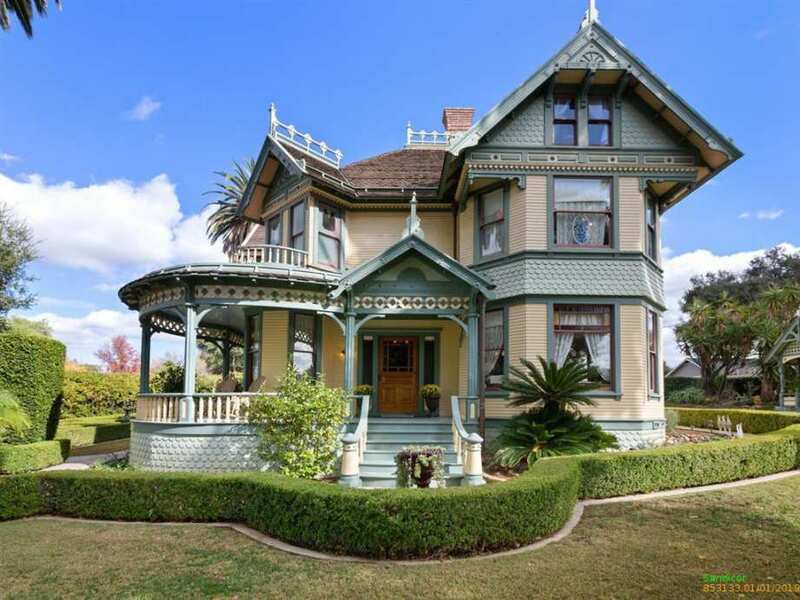 This famed Queen Anne Victorian estate is one of San Diego's cherished architectural treasures on the National Registry of Historical Places and part of the Mills Act, a state law allowing local governments to reduce property taxes (by as much as 70%) on historic properties in exchange for the preservation of such properties. 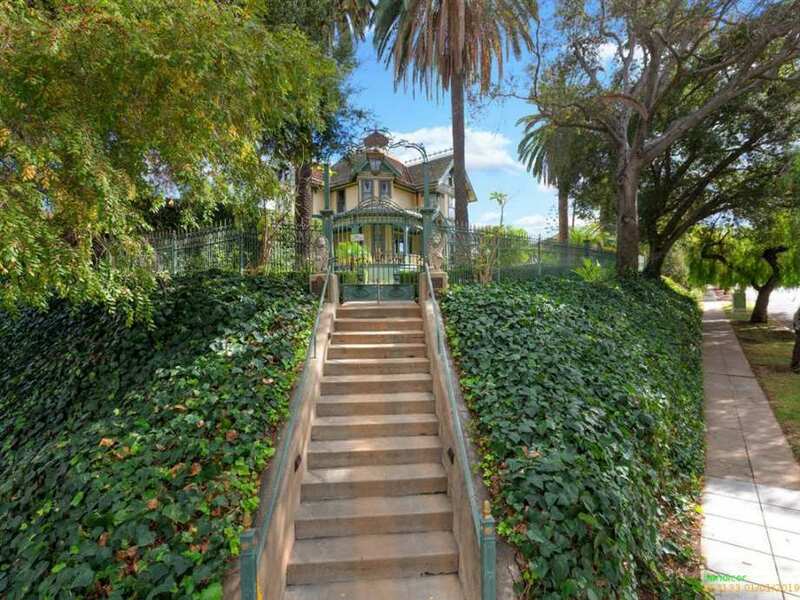 Escondido's "Crown Jewel" sits on a corner lot, atop a private knoll on a flat . 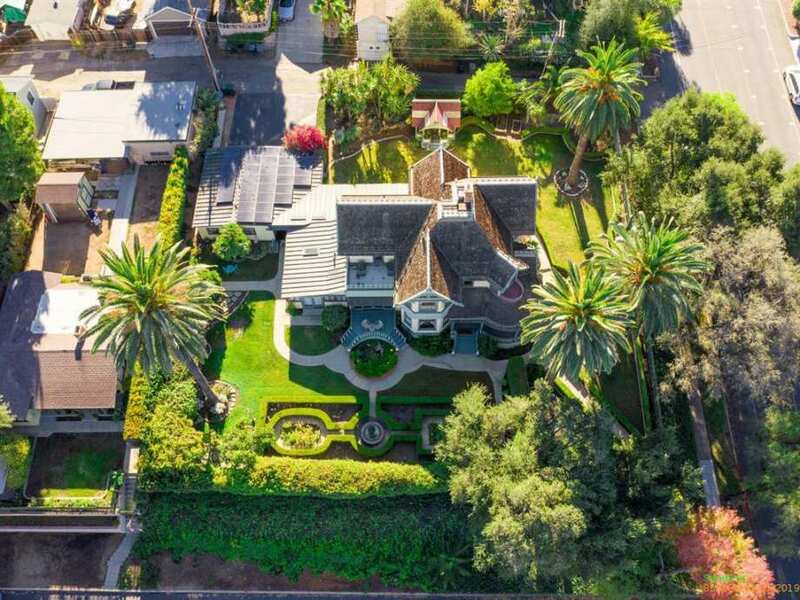 5+ acre lot, surrounded by exquisite gardens, mature trees and a 360 degree gold-tipped, hand-welded privacy gate. 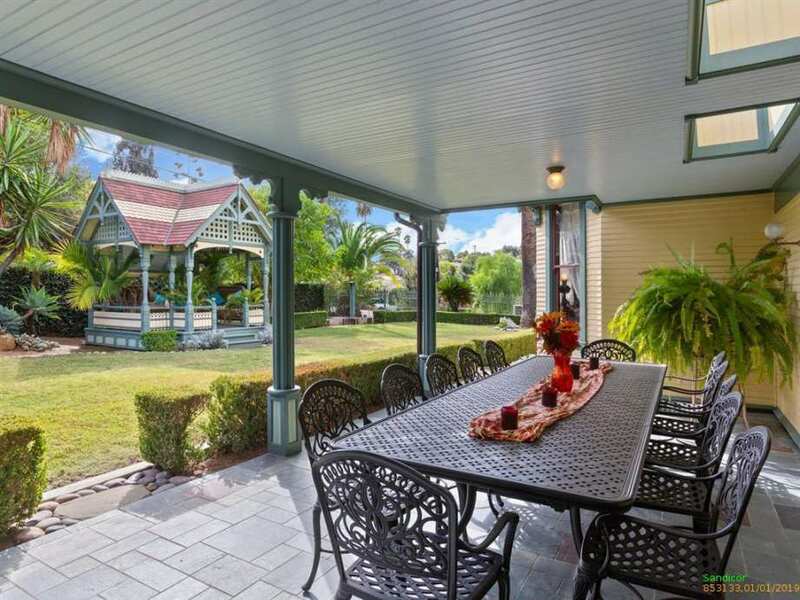 An elaborate 2001 Award Winning Swiss Victorian gazebo provides a private, serene environment to enjoy afternoon tea and entertain family and friends. The interior is a warm and romantic, articulately planned, hand-designed masterpiece. 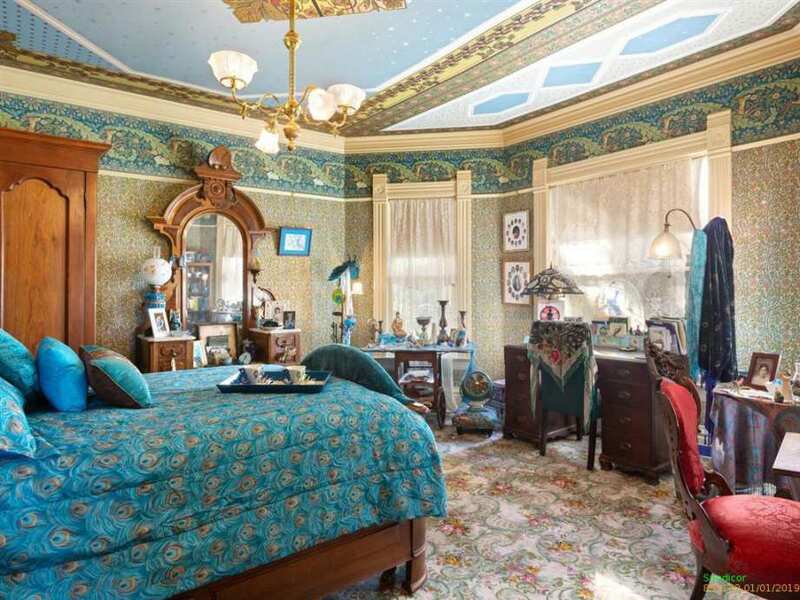 A virtual gallery of music quality adornments, 700 S Juniper boasts one of the most intricate collections of hand-printed Bradbury & Bradbury wallpaper in the country. The estate features generously proportioned sunlit rooms, a formal living room, 4 bedrooms, 2.5 bathrooms, a garden and breakfast room, stately porches and a SOHO award-winning gazebo, hand-crafted wood doors, trim, knobs and hinges, genuine antique lighting and fixtures, turn-of-the-century finishes and furnishings from all over the world, including the personal homes of famed historians and figures, such as Ulysses S. Grant and Wyatt Earp. 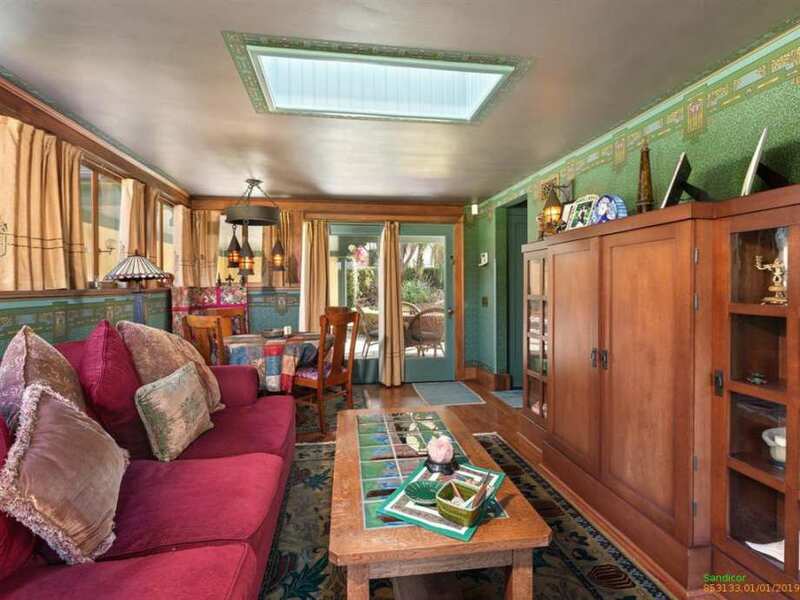 Located within walking distance of a charming downtown area and the Mingei Museum, antique and art showrooms, as well as the California Center for the Arts, this home is in the heart of the Old Escondido Historic District. 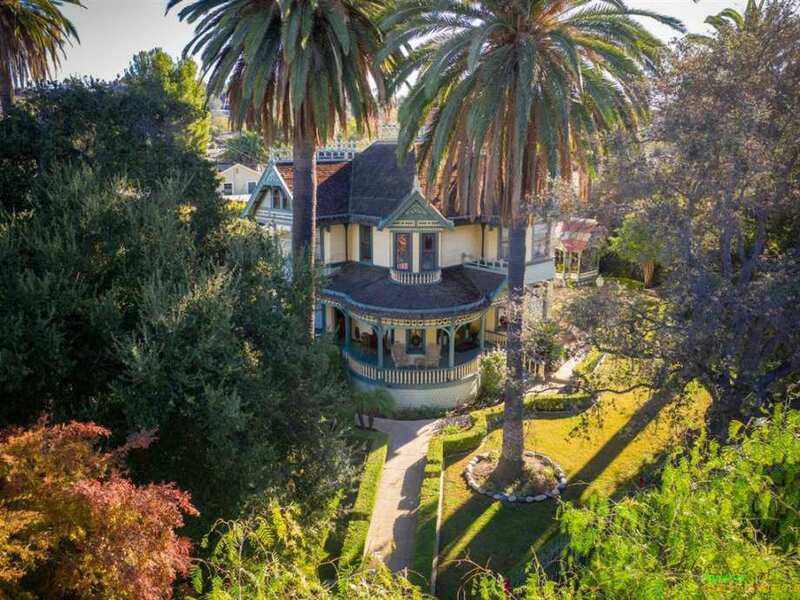 The house was originally built in 1896 by real estate agent Albert Beach, at a time when Escondido had 1,000 residents, according to census records. 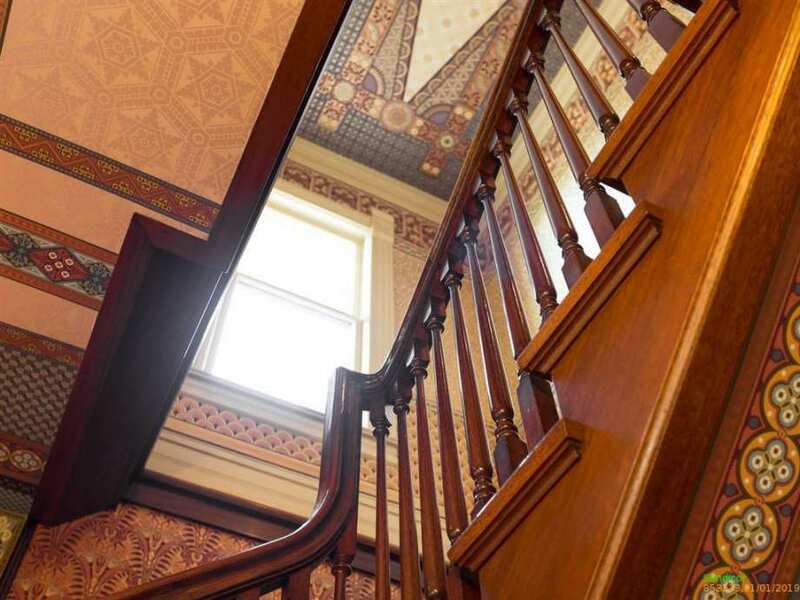 The house's restoration has received more than 18+ editorial and design awards and in 2001 was the subject of the PBS TV show "Restore America. " Previous owners, Virgil and Natalie Bergman, were responsible for placing the house on the National Register of Historic Places in 1994. Bergman was a former dean at Palomar College and president of the Escondido Public Library's board of trustees. * Additional, in-depth details about the home's history, renovations, finishes and furniture available upon request. Linked up top are the National Register report and a link to a photo gallery with nearly 100 photos. According to Zillow, a 440% price increase since it last sold in 2016 for $611k. Mysterious, as I pass this house daily and nothing different has been done to it. 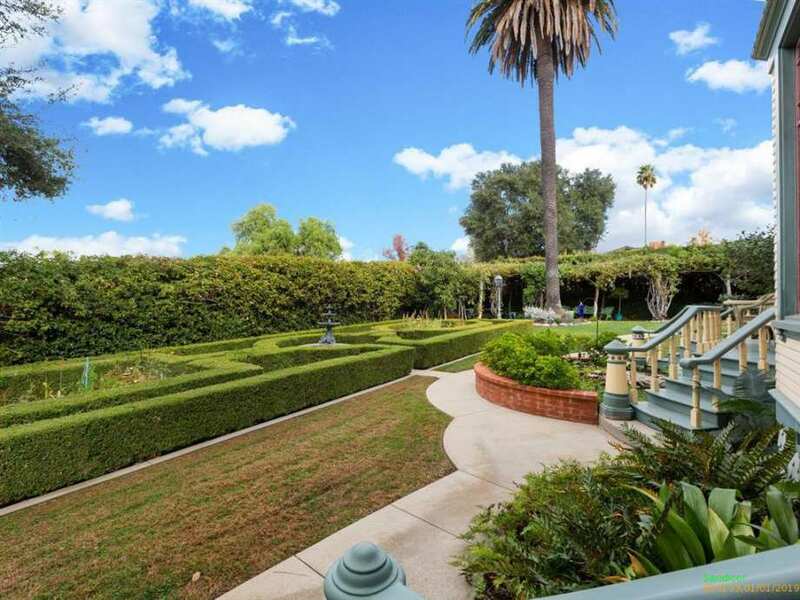 It’s impeccably maintained, and in Escondido’s historic district, but probably the people looking in this price range around here are going to be looking out in the nearby hills at estate properties with pools. We can only hope an OHD’er with deep pockets craves this one! I have been through it on the annual house tour and the kitchen and yard are much smaller than they appear in the photos. That being understood, it’s still my number one favorite house in my town and I wish I could afford it. I’m seeing it sold for $1.6 million. That sure sounds more likely; I’m just going by Zillow. But even so that’s triple the price. Thank you for your feedback! Unfortunately, the last recorded sale is not accurate, and does not reflect the full purchase price. My clients have made improvements and modifications to the home, and you’re right, it’s in impeccable condition! 🙂 The current list price is its current assessed value with the full renovation and restoration. I’m thrilled to hear that its your #1 favorite house in town. It truly is a gem. Thank you, thank you for contributing to the listing feedback! What fun to look at…and to dream about. I never knew wallpaper could be so beautiful. Gorgeous property. Wish I could afford it. Thank you, Janet! It’s truly a gem; it’s even more amazing in person. Escondido is a lovely town in San Diego County. 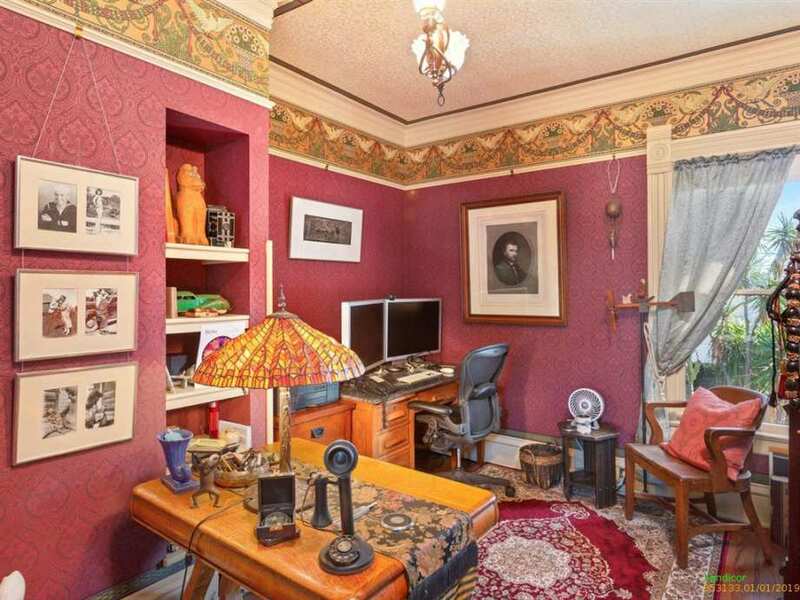 The Bradbury & Bradbury wallpaper alone is worth $25k probably…at least. 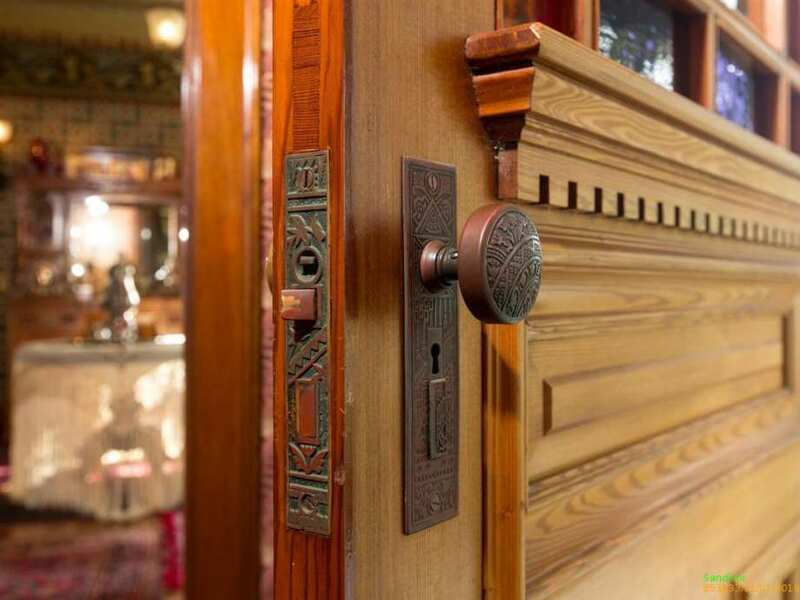 Mills Act is a lifesaver for us Californians-I am lucky to have it in my 1915 Craftsman. What a treasure this beauty is. Thank you for sharing. The wallpaper is worth a lot more than that. I did one room in my house with Bradbury&Bradbury and between labor and paper it was $14,000. 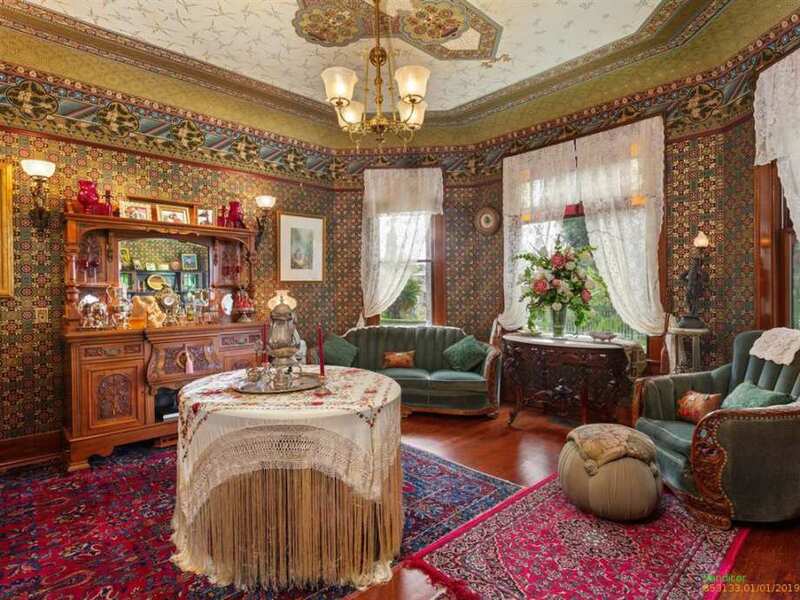 I would say well over $100,000 in wallpaper. Probably right. 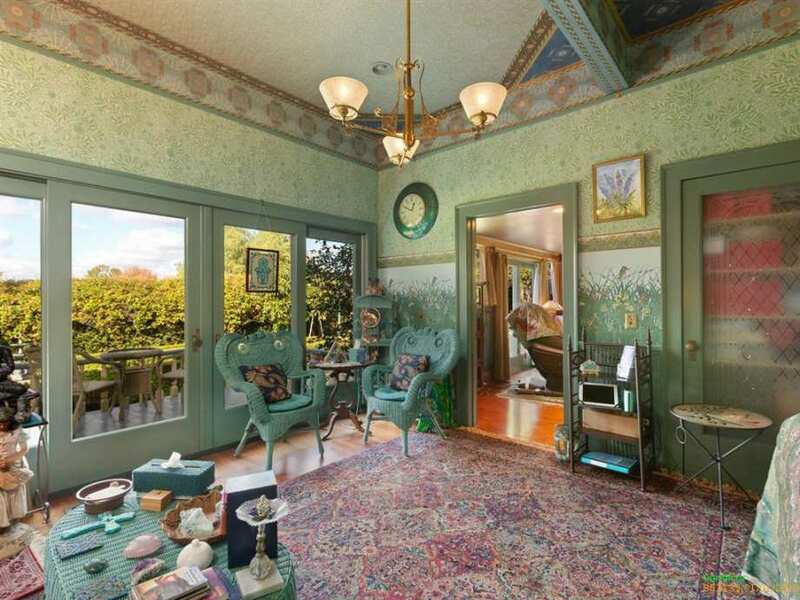 The Burrow and the Bradbury wallpapers and ceiling papers are very expensive. 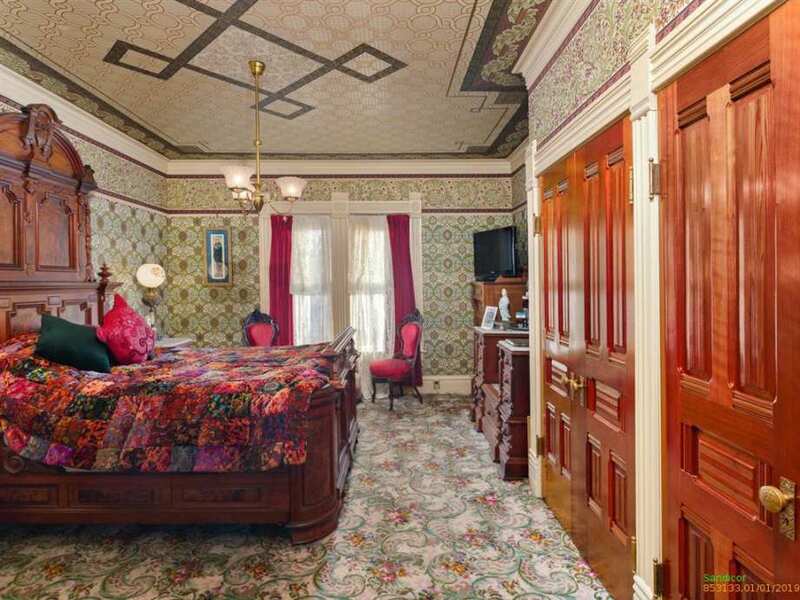 I looked into years ago and ended up opting to recreate the elaborate ceiling and wallpaper stencils in my house. Much cheaper, but certainly much more backbreaking. 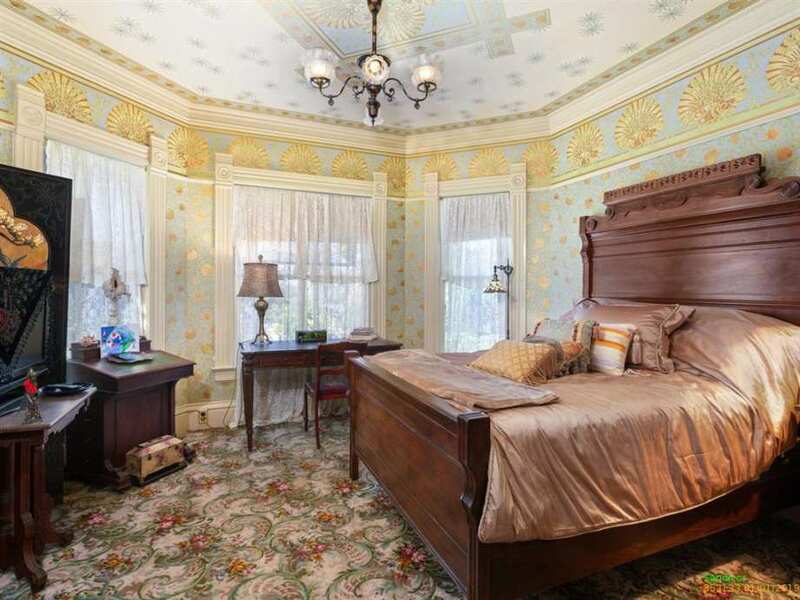 And though I love the wallpaper and ceiling papers produced, I’m a little sick of seeing them in many historic houses. There are thousands of designs out there in libraries and museums everywhere of beautiful patterns, some even way more beautiful than this, I almost wish they’d come out with more options. Thanks Sandy! 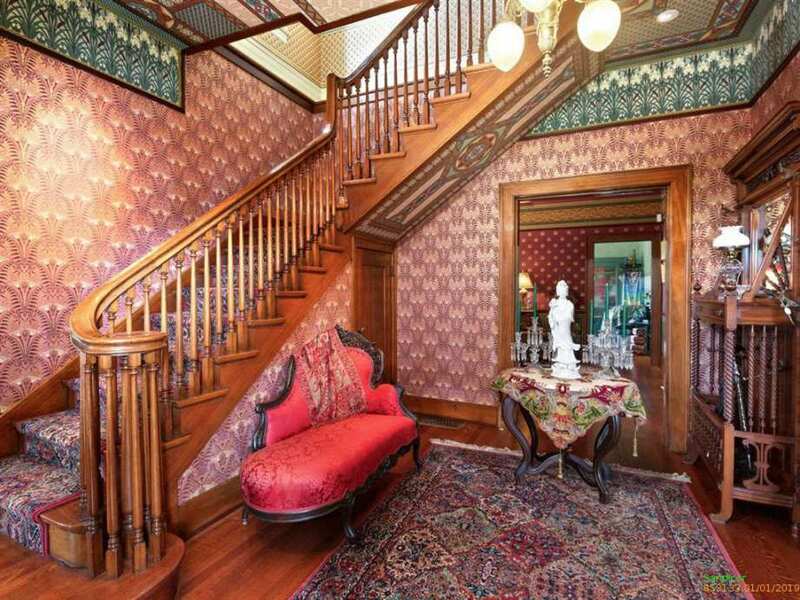 There is $250,000+ in B&B wallpaper in the home, handprinted and laid. 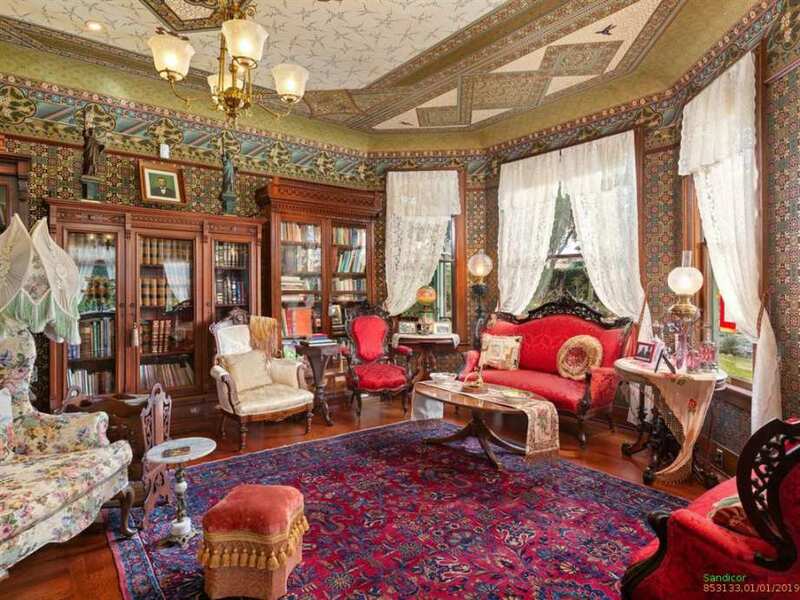 It’s one of the biggest and most intricate B&B collections in the country….truly a masterpiece. Absolutely over the top stunning! Even the furniture is stunning! I LOVE this home! Thanks Becky! Every piece has a story, as well. The owners brought in pieces, carefully curated and/or handmade, from around the world. 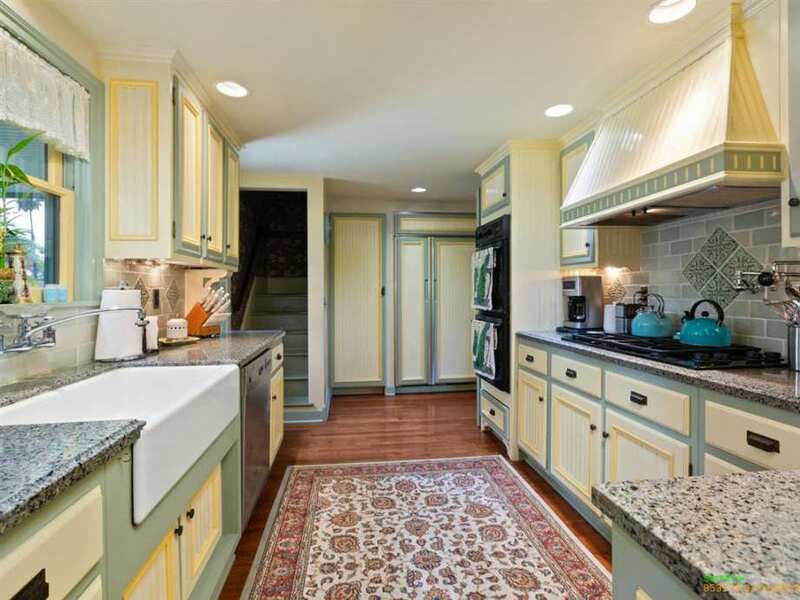 The intimate, low ceiling, kitchen and back room are my favorites: very nicely done. The museum is really great too. The antique plantings on the grounds are stunning; especially the palms. Doesn’t get much fancier than this. Rosewater, I agree! Every room has its own special story, design and mood. Thanks for your comment! Exquisite! Love everything about this house. Just a little over my budget. I can dream though. That very unusual footed, square bath tub is the most beautiful tub I have ever seen! It is picture 19. Thanks for your comment Jeanne! The bathtub came from Doris Day’s Estate with embossed bronze legs that are nickel plated. It has a bronze medallion, is re-enameled cast iron with oak rim. I love the house and especially the grounds. The wallpaper not so much. It is just too busy for me. 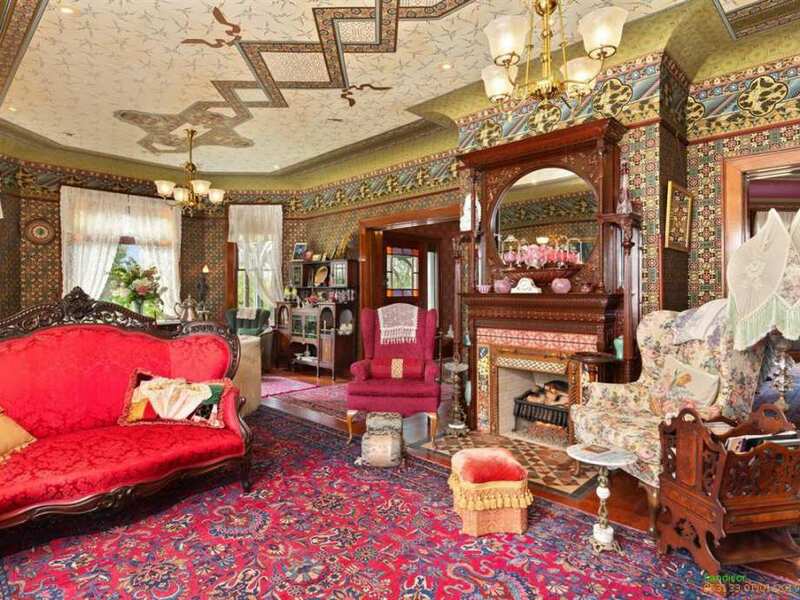 The very first house i bought was owned an old lady who wallpapered even the ceilings. In a prairie house. Steaming all that mess off did me in on wallpaper. 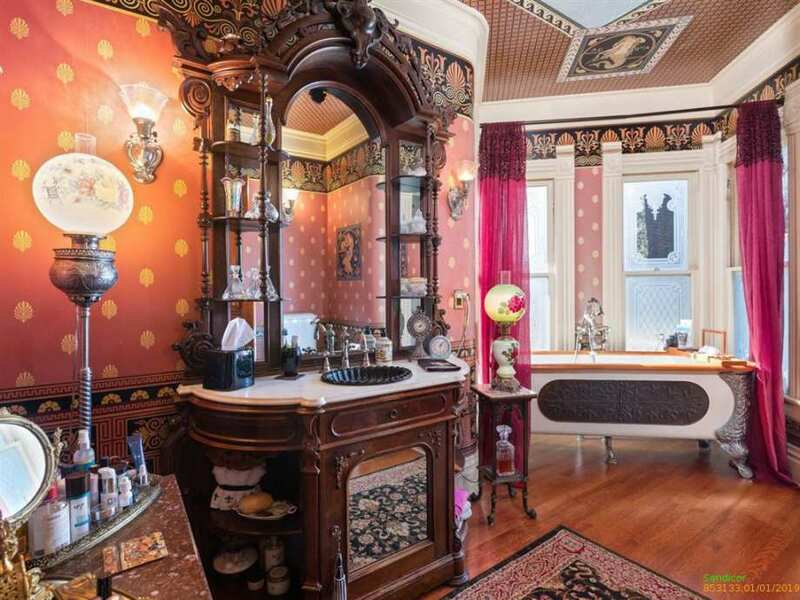 But to each their own and i know there are those who are all about it.Certainly wallpaper in a Queen Anne makes way more sense than in a prairie house. Property in CA is for the most part so expensive for what you get. But i can see the appeal of the climate there for sure. So nice to see that a gazebo of that quality could still be built as recently as 2001. 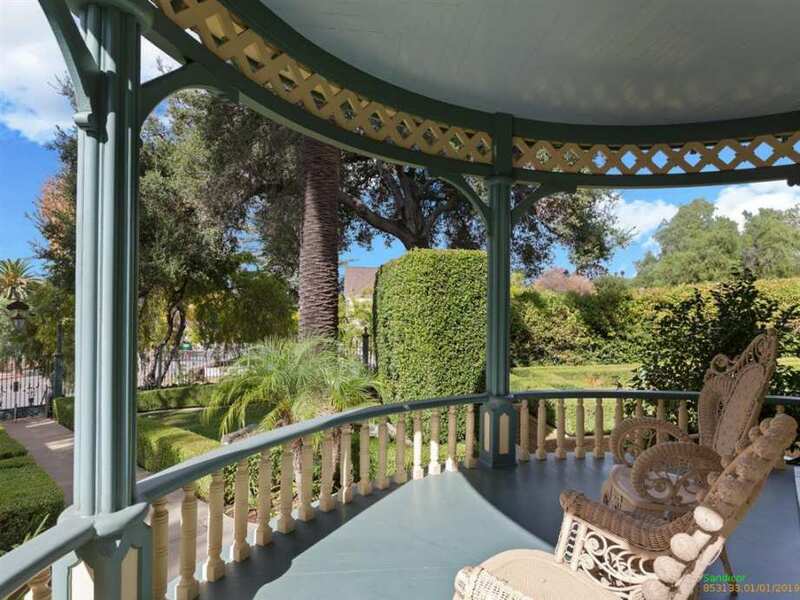 Not one nail was used in the construction of this gorgeous, Swiss-victorian gazebo. It’s a masterpiece! With each picture my jaw dropped a little more. I don’t necessarily like wall paper, but the paper in this house is gorgeous! I too like the square claw-footed tub. I usually don’t look at the furnishings as they do not get sold with the house, but some of the chairs and couches have to stay. The gazebo is cute as a button. I love this house. Thank you MJ for the awesome feedback! I am still in the bathroom looking at that lovely bathtub. I just thought my old claw tub was fancy. This house is exquisite. 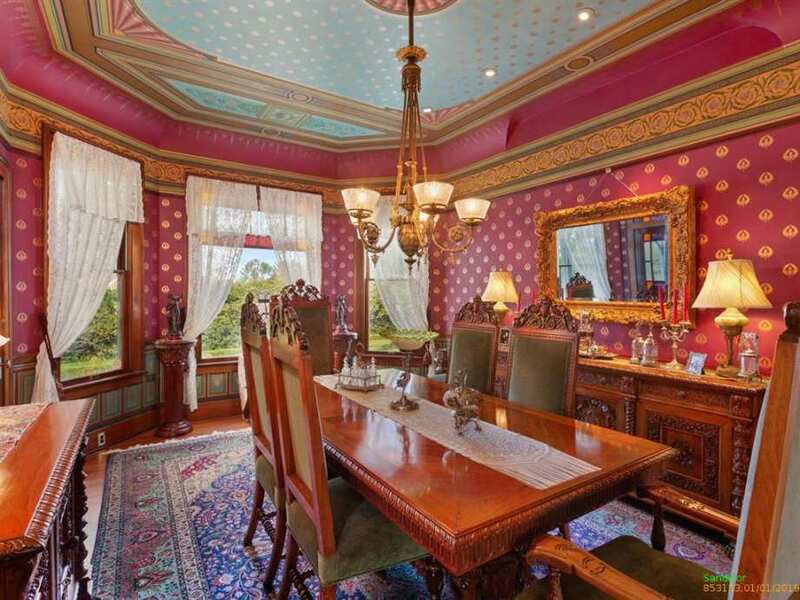 I love all the wallpaper but love the coved ceilings even more. I am wondering about the change in the cove in the dining room, though. Missing built-in hutch perhaps? I’ve died and gone to wallpaper heaven! I usually don’t care for it, but I’ve always loved the B and B ones. I don’t think I’ve ever seen as many designs in one place unless it was San Francisco. As much as I despise carpet, I even like it! I couldn’t see anything past those 2….guess I’ll have to scroll back and look for the tub! Dollhouse! An absolute dream home. Waking up each morning in this lovely home would be a dream come true. Definitely enamored with this stunning beauty!